Fraud is on the rise–and no industry is immune. From healthcare to insurance to firms with highly valuable intellectual property, targeted companies are losing billions. In fact, it is estimated that the typical organization loses five percent of its annual revenue to fraud. Hit particularly hard are financial services, communications, technology, and entertainment. In an effort to stem ...the losses, eCommerce merchants and financial institutions alone are expected to spend USD 9.2 billion on preventing fraud by 2020–a 30 percent rise over current levels. But they are hampered by increasingly sophisticated fraud schemes and legacy detection systems that can’t keep up. A key challenge is that fraud perpetrators bury repetitive but small fraudulent transactions in seemingly benign business processes, making them hard to detect. Companies need smart, reliable ways to monitor patterns of suspicious behavior that come with the transformation of online business, connectivity, cloud-based services, and mobile applications. Most legacy fraud detection tools are rule-based and are limited to finding known issues. The challenge is to find emerging, unknown fraud patterns that a company doesn’t know exist. By tapping metadata from numerous sources and data types, crucial contextual relationship patterns can predict and prevent illegal, fraudulent activity. Though most organizations have huge volumes of data at their disposal, few of them have effective methods to extract, transform, and load it to create actionable information to act quickly enough to mitigate risk. Until now. 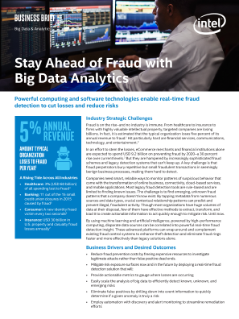 By using machine learning and artificial intelligence, powered by high-performance computing, disparate data sources can be correlated into powerful real-time fraud detection insight. These advanced platforms can wrap around and complement existing fraud control systems to enhance theft detection and eliminate fraud rings faster and more effectively than legacy solutions alone.